^ Herlihy, p. 140 "12.5 metres wide and 21.5 metres wide"
^ a b c Kononova, p. 51. ^ a b Kononova, p. 49. ^ Kononova confusingly writes on page 48, "The idea of an architectural ensemble with a broad flight of stone steps leading to the sea which links the high bank with the low shore and provides a gateway to the city, belongs to the well-known St. Petersburg 19th century architect w:Avraam Melnikov." But on page 51 writes, "The famous Potemkin stairs leading from the square to the sea and Uiltsa Suvorova (Suvorov St.) was designed in 1825 by F. Boffo". Kononova, G. (1984). Odessa: A Guide. Moscow: Raduga Publishers. オリジナルの2007年9月28日時点によるアーカイブ。. 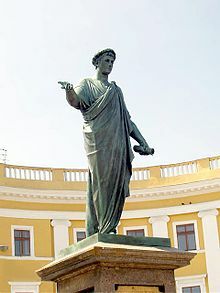 https://web.archive.org/web/20070928000158/http://www.2odessa.com/wiki/index.php?title=Odessa_a_guide#51.